Being organized is one of the keys to success in college. It doesn’t have to be hard or expensive to get organized for college! It can make or break your success at college. So here’s how to get organized for college in 5 easy steps. 1. Binders & Folders & Sticky Notes, Oh My! The first way to get organized to for college is to organize your binder. There are many ways to organize a binder, but I have found this to be the best way. You’ll need the following to get started: a binder(duh! ), some folders, sticky notes, and some college ruled paper. 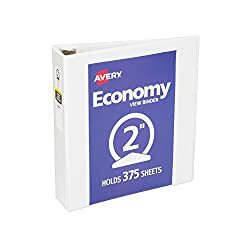 For binders, I personally prefer a 2-inch binder so that all I need is one binder. Just your basic white binder will do. 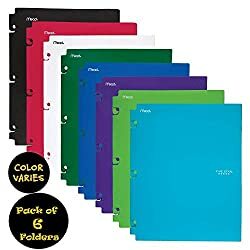 I’ve found that it doesn’t matter if you splurge for the fancy Mead binders or you just get the basic ones. Neither are really all that durable. Plus, you can always dress up your basic white binder with some scrapbook paper or motivational quotes. For the first couple of weeks of a new semester, I keep a copy of my class schedule in the cover of the binder. I like to have a folder for every class in my binder. Mead is the most durable brand. I LOVE their poly folders. There are so many different colors to choose from. And, they have regular folders as well as folders that you can put in your binder depending on what you prefer. These page markers are game changers! 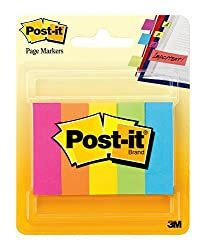 You can use them to mark your place in your textbook, use them as dividers, or you can write yourself a little reminder. Although, I mostly use them for dividing sections by test in my binder. These are handy as well if you prefer to use actual dividers instead of page markers. 2. Let’s Get Technical, Technical! Is anybody else singing “Let’s get physical, physical” in their head right now? No? Just me? Okay. Repeat after me, I will NOT forget to put my recorder back in my bag after class! I did once and I was lucky that a) my college is just 10 minutes away from where I live and b) nobody had stolen my recorder. This recorder has such good quality audio! And, it doesn’t have any apps or games as a distraction! The built-in USB means it’s SO easy to transfer your recordings to your computer. Plus, it even has a built-in stand too. How cool is that?! Also, I would recommend keeping an extra set of batteries on hand since this model only runs on batteries. The battery life is great though! This little thing right here will help you make friends for sure! Now, say goodbye to fighting over power outlets to charge your phone or devices. If you use a laptop during class, there’s nothing worse than the battery dying halfway through lecture. Google Drive is a life-saver if you like to type your notes. You can easily access your notes anywhere on any device! Although you can convert a Google Doc into a Microsoft Office file, it’s just easier to have Microsoft Office to make sure the formatting is correct. Things get lost in translation when you start converting files. Most schools give you access to Microsoft Office for FREE with your school e-mail address. I definitely recommend checking out what resources your school has to offer. An easy way to make sure you have everything you need for class the next day is to put it in your backpack the night before! So simple, yet so overlooked. This also comes in handy with picking out what you are going to wear to class or packing gym clothes to get your workout in at the school fitness center. Speaking of working out, that’s my next tip. 4. This May Sound Crazy, But Sleep And Workout Maybe! You’re probably thinking, what the heck do sleep and exercise have to do with organization? Well, exercise helps clear your mind, which can help you in multiple ways! Like not forgetting if you turned an assignment in even though you marked it as done three times in your planner! And plus, exercise is so good for you! You’re more than likely paying for access to the fitness center on campus through some part of your tuition and fees so why not get your money’s worth? 5. Become One With Your Planner! Inhale. Exhale. Inhale. Exhale. I am one with my planner. Inhale. Exhale. Inhale. Exhale. Wait a minute, this isn’t a yoga class…. but seriously Y’all get a planner! Get an Erin Condren planner, use Google Calendar, write everything down on a napkin and knock on wood that you don’t lose it. SOMETHING.I might take planning to the extreme… a little bit. Okay, maybe a lot. Let’s see, I have a dry erase calendar in my room in addition to my bulletin board, I use both Google Calendar and Outlook’s calendar, AND I put all of my assignment due dates and test dates from class syllabi into what I call my “master assignment schedule”. Okay, DEFINITELY a lot. Doing one of those things would be plenty for the normal person, but clearly, I’m not normal. That-that-that’s all folks. How to get organized for college in 5 easy steps. Thank you so much for reading! Please leave a comment if you found this useful or if you have an awesome organization hack to share! Thanks for sharing these are so useful!